Home Blog On-Site SEO Versus Off-Site SEO – Which is more important? If you are new to digital marketing and looking for free traffic on your website then you need to optimize your website for a search engines or need a help of SEO expert. However, before initiating it you must be familiar with few things about SEO services and their important elements. 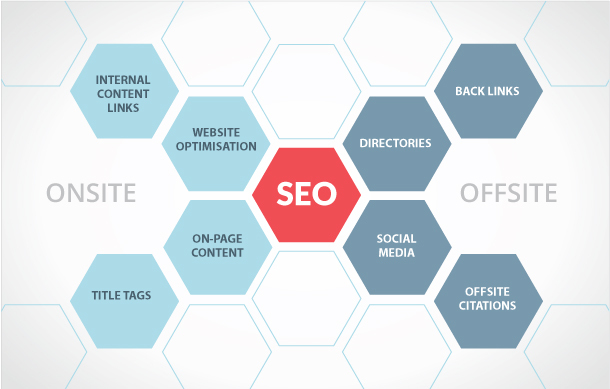 So, let’s know a few key points about search engine optimization. Generally SEO categories into two parts, On page SEO and Off page SEO. On Page optimization consists all internal activities on your website that help search engine to crawl or understand your website content effectively. In another side Off page, includes all promotion activities to promote your website and popularity. A smart move may be to focus on on-site SEO first before spending money or time on off page activities. Once you’ve accomplished with on page activities and your website is filled with useful content like videos, images, articles, blogs than you can easily promote them to get the best output from search engine optimization. I also like to confirm that It doesn’t matter that how big your website or how long content you have put on your website. It does not work until your content starts displaying to the targeted audience. Firstly you have to optimize your website to display in the search engine. This will involve making sure your website contains titles, description and keywords tags, and content is written to focus targeted keywords. Keyword research is very important as its hard to know that what people type to search services or products. Also, it helps you to drive relevant traffic to your website as there is no use of traffic that does not help to increase revenue from your website. So, on page optimization is a very important aspect of SEO and doing it the right way is necessary for online business success. Off-site optimization is equally important but the all the things you do in off page is not directly related to changes on your website. This includes content marketing, social media marketing, building quality backlinks, Video marketing, infographic marketing and so on. Off page SEO efforts are an ongoing activity and must be done to get ranking in search engine. However, building quality links is not easy and it’s very time-consuming. You also need to aware that low-quality backlinks may harm your website in search engine ranking. Finally we can say that on page and off page optimization equally important and can’t be ignore. All the major search engines like Google, bing, yahoo often change their search algorithm so you rank today may not be where you rank tomorrow. You need to keep updated your search engine marketing strategy with latest algorithm so that you can have more benefits with each updates.